On Saturday, July 6, there was a massive fire at the Milwaukee County Courthouse which started when the very old and out of code electrical infrastructure started on fire. Since the fire, Milwaukee County Emperor Chris Abele has been doing his best to control the message and the spin so that people don't focus on the cost of the clean up and repairs, the risk he is putting people in by opening parts of the courthouse too soon and the fact that the fire stemmed from his deferred maintenance and willful failure to replace the faulty equipment even though he had been warned of the danger. While Abele is trying to come off as transparent and working real hard to fix the problem, there are things that he is omitting, besides the fact that he is responsible for the damage and added expense to the taxpayers. 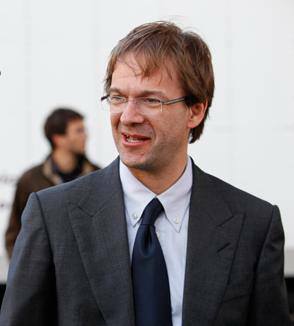 When Abele directed the Child Support Enforcement workers back to the courthouse, it was before their work area was clean. The area was sooty, smoky and filled with dead roaches. Workers were sent home for another day off with pay. But now the hapless Abele has managed to make a bad situation for himself even worse. It is being reported that Abele is launching a PR move called "Courthouse Proud." The idea was supposedly to recognize the public and private sector workers who toiled day and night to try to get the courthouse operational again. But Abele has a few problems surrounding what should be a no-brainer thing. 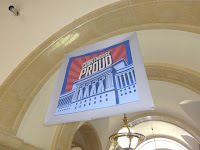 The "Courthouse Proud" logo features four blue upraised fists and forearms as pillars on the courthouse against a red background. The much publicized and widely reprinted blue fist on "Stand with Wisconsin" posters during the 2011 battle over collective bargaining at the Capitol has just one clenched fist, blue against a red background. David Eisner, contract administrator for District Council 48 of the American Federation of State, County and Municipal Employees, said the banner and shirts won't sit well with many employees. Abele is "trying to distract or distort the real issue and make it into kind of a pep rally thing," Eisner said. The courthouse's aging electrical infrastructure should have been maintained better so the fire didn't happen, he said. "It's a buncha crap, that's what I say," said Eisner. No cause of the fire has been established yet, according to county officials. As for the blue fist image: "It is a little different, but it's a blue fist," Eisner said. "Is (Abele) starting a union of his own?" He questioned whether the use of the blue fist for the banner and shirts might infringe on the American Federation of Labor and Congress of Industrial Organizations' "Stand with Wisconsin" imagery. The courthouse fist image was put together by staff at Laughlin Constable in response to a request from Don Tyler, the county's director of administrative services. Both Steve Laughlin and Tyler have served on the Milwaukee Symphony Orchestra Board. The design work was done at no charge, said Evan Zeppos, a managing partner at the Laughlin firm. The T-shirts were parceled out to those most heavily involved in cleanup efforts, Conway said. A tally of who got the 266 shirts distributed so far included staff from eight county departments, as well as workers from We Energies and two private contractors. Conway said there were still some left over, but those are "somewhat spoken for," he said. "You've got to earn it," he said. In this little blurb, Abele has made a complete mockery of the county's Code of Ethics (Chapter 9). The Standards of Conduct (Chapter 9.05) make it explicitly clear that no county official or employee can take or give anything of value or solicit for anything of value. Yet we have Abele sending his Director of Administration to ask for a logo design which he gets free of charge. Abele then turns around and starts doling out these t-shirts to those who "earn it." Just about everything about his PR stunt has the potential to be illegal and actionable. The fire might be out, but it doesn't look like anything is about to cool off anytime soon.